Summary: A status report about the end of the post-WWII world. The great recession has accellerated the process, revealing its weaknesses and showing the people of the rapidly growing emerging nations that they have outgrown it. The US is almost its lone defender, a futile effort wasting time and resources that could be spent adjusting to the new world being born. DUBAI, United Arab Emirates—The most potent challenge to Iran's ruling system may not be international sanctions or the homegrown political opposition, but something as simple as a shopping list. When Sanaz, a 47-year-old Tehran mother, goes to market these days, she digs deeper into her purse for the basics: bread prices up more than fivefold, cooking oil more than double, cuts of lamb about triple from last year. "How much can we stand?" said Sanaz, who gave only her first name because of security fears. "People are very angry and very worried." It's just the beginning of more expected price hikes -- including for Iran's cut-rate gasoline -- as Islamic leaders start trimming an estimated $100 billion a year in government subsidies for fuel and food staples that many low-income Iranians consider a birthright. HOUSTON — Eager to win approval for its stalled plan to drill for oil in the Alaskan Arctic, Royal Dutch Shell is beginning a public lobbying campaign, including national advertising, on Monday. As part of the effort, the giant oil company is promising to make unprecedented preparations to prevent the kind of disaster that polluted the Gulf of Mexico earlier this year. Shell’s plan to drill in Alaska’s Beaufort and Chukchi seas has been snarled in regulatory delays and lawsuits for four years. The company has already invested $3.5 billion in the projects, and it was close to overcoming the final regulatory hurdles to begin drilling when BP’s Macondo well blew out April 20, killing 11 rig workers and spilling millions of barrels of oil into the gulf. BP Plc is close to signing a “major” exploration agreement with state-owned China National Offshore Oil Corp., Sky News’s Mark Kleinman reported, citing unidentified people. BP and CNOOC would jointly explore in the South China Sea, Kleinman wrote on his blog today. The two companies have previously worked together in that body of water, he said. BP aims to complete the negotiations before U.K. Prime Minister David Cameron visits China in the coming week, Kleinman said. Peak Oil is not yet biting the global markets (or economies) as evidenced by a falling price of crude oil relative to other commodities. The time for traders to enter Peak-Oil related trades has not yet arrived. Many middle-class and wealthy Venezuelans have done exactly that, creating a slow-burning exodus of scientists, doctors, entrepreneurs and engineers. But wander into the bazaar in the shadow of Santa Teresa Basilica in this city’s old center, and the opposite seems to be happening as well. Merchants murmur in Arabic, Urdu and Hindi. Haitians pushing ice cream carts chatter in Creole. Street vendors selling DVDs call out in Colombian-accented Spanish. Sip coffee in Naji Hammoud’s clothing shop, where photos of Lebanon’s Bekaa Valley grace the walls, and the outlook is downright bullish. Support for renewable energy will wane. In Pa., natural gas and coal industries will thrive. So much for the Age of Aquarius. The Republican landslides in Washington and Harrisburg will slow the growth of government support for renewable energy. And fossil-fuel interests that supply 70 percent of the nation's electricity will face less pressure. Masdar, an Abu Dhabi government- backed renewable energy company, is in talks with the Swiss government to allow at least 20 firms from Switzerland to establish offices at Masdar City, The National reported. The companies signed up with Swiss Village Association, a semi-governmental organization, to have a presence in the zero- carbon Masdar City project, the newspaper said, citing Wolfgang Bruelhart, Switzerland’s ambassador to the United Arab Emirates. Ten years ago the investment mega-trends to get on board where the emerging markets and commodities such as Gold, all clear in hindsight you might say, so what about the mega-trends for the next decade ? Well, apart form inflation which impacts on virtually EVERYTHING, the next big growth area given the fundamentals of climate change and arrival of peak oil has to be NUCLEAR. To be blunt the environmental fundamentalists have once more been found to be barking up the wrong tree for several decades by pumping out anti-nuclear propaganda for the past 30 years, which is why in the west nuclear power has been a bad word with hardly any nuclear power plants having been built, which is GREAT NEWS for investors ! Because that means your going to be getting in near the ground floor of a new multi-year if not multi-decade nuclear boom! How else are the governments going to power future energy demand whilst at the same time cutting carbon emissions,, if not by building literally hundreds of new nuclear power stations over the next 20 years. TOKYO — Tohoku Electric Power Co and Kyushu Electric Power Co will invest in a uranium enrichment plant operated by Areva NC SA in France to help secure a stable supply of enriched uranium for their nuclear power plants. Honda Motor Co., Japan’s second- largest carmaker, plans to build hybrid vehicles in China, the company said today on its website. The Tokyo-based company didn’t give further details of its plan. Siemens AG, Europe’s largest engineering company, said it is close to signing a contract to supply a Chinese city with electric-vehicle charging infrastructure. The company expects to complete a deal this month to provide customized charging posts for one city, Song Xiao, the Shanghai-based president of Siemens China Smart Grid, said in an interview in Shenzhen, China yesterday. He declined to name the city as the deal hasn’t yet been approved by the government. The German company will produce an electric model at local ventures with SAIC Motor Corp. and FAW Group Corp. as early as 2013 and add a battery-powered model specifically designed for the nation in 2018, said Karl-Thomas Neumann, president of Volkswagen Group China, at a conference in Shenzhen, China. The power was out at my house last week. I arose the next morning to spent candles and dried food jars scattered around the kitchen (hub) table. My family knew not to open the refrigerator door during a power outage, so they ate dried apples, nuts and seeds. While putting the jars of food away, I was reminded of young friends who spent this summer and fall canning and drying food grown on their farm. At the time, they had jokingly suggested they may have gone a bit over-board; evidently there are shelves upon shelves of food in jars. I empathized, I am sometimes given a second look when I state 60 jars of canned tomatoes might not ‘be enough’. Enough for what? Enough for the times the power gets scarce. Lomborg's new documentary film, "Cool It," amounts to several things. It's a star vehicle for Lomborg, who seems to be anointed as a conservative climate poster boy for the new era in Washington. It's clearly designed as a counterpoint to former Vice President Al Gore's film, "An Inconvenient Truth," which helped spur the climate debate after it was released in 2006. And the resources lavished on "Cool It," which opens in theaters Friday in San Francisco and 19 other metropolitan areas nationwide, suggest that there's a well-financed effort underfoot to spin the failure of climate action into a new political strategy for high-tech mega-investments. We Australians seem to have an unfortunate focus on ''silver bullet'' responses to climate change. Whether it is the holy grail of ''clean coal'' or an elegant carbon pricing mechanism, we seem to want to tick off the solution and "move forward". We are now re-entering discussion about putting a price on carbon, and the focus is on choice between a tax or a trading scheme, or a hybrid of the two. But both price-focused solutions are being oversold. The US abandoning an emissions trading scheme was a symptom of its political climate and should not be a signal to other countries to follow suit, Secretary of State Hillary Clinton says. Reporting from Washington — For decades, California has set the pace for the country on air pollution and climate change, adopting ever-higher standards for controlling auto emissions and, more recently, greenhouse gases that scientists say have led to global warming. Now, California's dominance is being challenged — under attack from another mega-state that wants to displace California by calling for a freeze of the status quo instead of a move toward tighter controls. In effect, Texas is staking out a role as the anti-California. It's conservatives who should fear climate change the most. To put it simply, if you hate big government, try global warming on for size. Many conservatives say they oppose clean-energy policies because they want to keep government off our backs. But they have it exactly backward. Doing nothing will set our country on a course toward narrower choices for businesses and individuals, along with an expanded role for government. When catastrophe strikes - and yes, the science is quite solid that it will - it will be the feds who are left conducting triage. Climate change could trigger a 10 percent drop in China's grain harvest over the next 20 years, threatening the country's food security, a leading agriculture expert warned in comments published Friday. TLAXCALA, Mexico — In these volcanic valleys of central Mexico, on the Canadian prairie, across India's northern plain, they sow and they reap the golden grain that has fed us since the distant dawn of farming. But along with the wheat these days comes a harvest of worry. Yields are not keeping up with a world growing hungrier. Crops are stunted in a world grown warmer. A devastating fungus, a wheat "rust," is spreading out of Africa, a grave threat to the food plant that covers more of the planet's surface than any other. In Chicago, London and other money centers, the wheat market is so roiled by bad news and speculators that rising prices may put bread out of reach for millions more of the world's poor. Already the precursor to peak oil, falling EROI (energy return on investment), is pushing up energy prices. Who can dispute that EROI is falling? Deep ocean wells are very expensive. Pre-salt wells will prove even more expensive. And getting oil from oil sands is also very expensive. And Arctic oil will be the most expensive of all. And who can deny that falling EROI is a precursor to peak oil? Given the decline in the value of the dollar relative to other countries, using the metric EROI only adds to the confusion. A truer picture of the situation would be to use the inflation corrected data, but the author does not specify his exact meaning. As we have discussed on TOD many times, there is an even better metric, Energy Return on Energy Invested (EROEI), which is not the same as a dollar denominated EROI. I think that this article demonstrates that there is some confusion between the two, as we really don't know to which of these metrics the author is referring. That confusion is the reason I have tried to convince writers on TOD to strictly use EROEI to highlight the difference between EROEI and EROI calculated in dollars. Is anybody listening??? Eric, as Undertow pointed out yesterday the dollar dropped 1.2% last week while oil rose 6.2%. And if you look at the historical dollar you get a similar picture. The Euro was introduced in 1999 at about 1.135 dollars to the euro. The value at the close Friday was about 1.4 dollars to the euro. That is a gain for the euro of about 23 percent in 11 years. I think oil has done a bit better. The price of oil has risen in all currencies, even gold. The EROI of oil is falling no matter what kind of currency you have in your pocket. It shouldn't touch currencies at all. EROEI needs to be expressed without the variables and emotional distractions of price. Keep it frosty! And a good gripe it is. I beat that drum 'til I was blue in the face, but academics will be academics. EROI should always refer to return on money investment, EROEI or ER/EI to the relative energy return on energy invested. It's better than "net energy" because it embodies a very salient limit in a reasonably intuitive way. Those who don't get why this is important have a mental toolkit ill-equipped for changing anything in the external world. Seeing the adademic articles here using EROI when the concept is ER/EI makes me roll my eyes; but other than giving you a high five for keeping up the fight, I've given up on it. Academia and activism don't seem to fit easily into the same headbone. Are you seeing EROI as distinct from EROEI? Some people use the two terms interchangeably so I'm not sure if you are referring to two distinct calculations. During the past few years, there have been five main efforts related to energy return on investment (EROI), although the total number of papers is not large. The first is a very intense and public discussion as to whether corn-based ethanol, a fuel whose advocates suggest can be an important substitute for foreign (i.e., non-U.S.) gasoline, is a net energy gainer or not. The second main effort was a fairly intense effort by our own laboratory to summarize what is known about the EROI of most major fossil fuels and renewable resources. The third was several papers by Nate Hagens and others pertaining to the framework for EROI analyses and the relation of EROI to both the economy and to water use. The fourth was an attempt to examine how EROI, or more specifically how declining EROI, might impact economic activity. Finally, the fifth was a series of papers, again generated from within our laboratory, about the potential importance of EROI for our economic system including an attempt to understand and calculate what the minimum EROI for a sustainable society might be. This paper gives some background and definitional material and then summarizes these research efforts in the above order. They then go on to distinguish the various types. They happen to prefer using "EROI" to refer specifically to financial payback, as greenish appears to prefer. May I suggest "normalized" net energy. You cant just make things up Ron. When you say oil has risen against gold, it is certainly not true over the last few months. It is also not true historically, although the ratio has been volatile. Here is a link to the gold/oil ratio over the last 4 decades. Seems we are back to the average at the moment to me, what do you think? EROEI would be more meaningful than EROI if anyone could agree on the correct way to calculate energy invested. One will probably have better luck getting people's attention when you tell them they are getting less energy for their buck or euro. And then there are those who think that energy from different sources cannot be compared, or something like that. The bottom line is that people will completely ignore both concepts until they see massive increases in gasoline prices at the pump. But then, of course, we will presumably go back into another recession or a deeper recession depending on whether you believe the recession ended last year. Others, in response to anticipated energy cost increases, are more interested in dollars saved per energy related dollars invested. More pain at the pump just increases the total dollars saved on my 2005 Prius. Given the interminable debates on TOD with respect to the calculation of EROEI, I despair of this ever becoming a useful metric. There are some pretty well accepted standards for LCA (Life-Cycle Analysis), which define their boundaries clearly. I think the EROEI disputes around alternative and nuclear energy is that these sources are simply argument magnets, and the advocates on either side are vulnerable to miscounting in their favor, even if done pretty much innocently. I agree with Aniya that we ought to have an official study by the National Academy of Sciences to clarify some of these heavily disputed challenges, and particularly the Available HydroCarbon resources.. ie, Peak Oil. Who could deny diminishing EROI is a precursor to peak oil? Here's a peakoil.com debate regarding Wondrously high EROEI oil fields from Days of Yore. The poster starting that thread wasn't exactly amenable to persuasion. There are some great photos in that thread, but they lead me to wonder... were the derricks really scratch assembled from dimension milled lumber on site, or were many of the components (cross beams, etc) pre-cut at a mill, and then delivered as a kit? Seems like it'd be safer and less expensive to put up pre-cut towers. I suppose the waste wood could be used as fuel, but with all that oil around, fuel doesn't seem like it'd be the problem. On the other hand, having a wood or oil fueled sawmill in the middle of some of those shoulder-to-shoulder fields seems like a very scary fire hazard. My maternal Grandfather worked on early drilling in Oklahoma where he was more of a carpenter than oilfield worker. He, his father and half-brother built a small oil operation before the elder's death. A big reason for making things from scratch was the lack of roads to the area where drilling was happening, and the location had to be cleared anyway. For true wildcat and expansion of fields, those factors were more of a factor, but it continued until the late twenties for him. If the well was a producer, the wooden derrick was used for completion and production and if not, it was simply burned down. BTW, after his experiences there, he moved the family to Dallas where he did work as a carpenter for the remainder of his working days. Joseph - suggest you check out some of the books in the "Early [insert state here] Oil:A Photographic History" series if you can, I have the one on California and some of the stories are nothing short of jaw-dropping. The one I've been recounting to any and all was how the exploratory well for the Los Angeles City Field was drilled with, drumroll please...a sharpened eucalyptus tree trunk. That's some low Energy Investment! In the short term, Bloomberg New Energy Finance reported today, price will be the most significant limitation to the uptake of both plug-in hybrid vehicles such as the Volt and fully electric vehicles such as the Leaf. The median base price of autos sold between July 2009 and June 2010 in the U.S. was $21,800. By comparison, the Leaf will cost $26,280 after federal subsidies (including an allowance for charger installation), which is a higher price point than three quarters of all new auto sales. Various state and other tax incentives can lower the price even more, but all of the subsidies - including the federal tax credits - are limited in number. Bloomberg New Energy Finance said the forecast is based on first identifying the "addressable market" for plug-in vehicles - those consumer segments that can afford the vehicle, have suitable range requirements and have access to an appropriate location for charging. Bloomberg New Energy Finance estimates that in 2011, the Chevy Volt will be targeting an addressable market of 7% of total U.S. auto sales, and the Leaf 11%. However, actual sales will be much lower and limited by vehicle availability. So much for the Great EV Hope. ~$22K sounded a bit low to me. I noticed the qualifier 'base price' and the reference to 'autos' (perhaps not trucks/SUVs?). I found this article from USA Today which states a median price of $29,000 + for the period of January through May 2010. I do not mean to quibble here, but ~$7K is a substantial difference, if the USA Today article's cited figure is factual. My bigger point every time I have heard this argument arise is to look at all the very pricey pick-ups, SUV, decked-out minivans, sports/sport cars, etc. and shake my head and dismiss the idea that the same people driving these current pricey vehicles 'can't afford' a ~ $26K Leaf. Two problems: Most folks want to spend the money they don't have on muscular high-weight, high-HP, decked-out status toys; and manufacturers do no make squat for profits off off small, inexpensive, light, no-frills vehicle products. As long as gas is priced as it is currently (~$2.60/gallon where I live most of the past year), there will be meager incentives for folks to switch their buying preferences. I agree. The Leaf isn't designed to compete with these vehicles. And very frankly cannot. I think its more accurate to compare it to a Corolla being used as a commuter vehicle. But then the Corolla starts out about $16k. As long as the upfront costs of an EV exceed the savings in fuel costs over the time retained by the original buyer, it will not make a great deal of sense for the vast majority of people. To the extent that the extra costs reflect energy embodied in their manufacture, it is not clear whether EVs save energy over their life time. They probably save oil, but this does not mean that they will do much to help the overall health of the planet. Anyway, it is the impact of the entire auto related infrastructure that should be considered. EVs are the way for the auto companies to stave off the long term demise of the auto. I would say we start killing of the auto now to hasten the day when we don't have to spend so much on energy and resource gobbling infrastructure. Subsidies are presumably a transition strategy to kick start the EV industry and crank up enough volume that unit costs can come down significantly over time. It is not at all clear that we will ever improve battery technology enough to experience a significant decrase in costs. It is not at all clear that we will ever improve battery technology enough to experience a significant decrase in costs. What ever happened to the "supercapacitors" that were supposed to revolutionize hybrid and electric cars a couple of years ago? they are in the same place as all those 'fusion power' story's that seemed to pop up not to long ago. Still, when you took college physics as long ago as I did, the idea of purchasing a 3000 Farad capacitor that you can hold in your hand on eBay is startling, at least. Or ten of them -- less total volume than a small shoebox -- wired in parallel to provide 30,000 Farads. Yes, they used to joke about about the absurd size of the Farad. However, the capacitors that you can actually buy are still much bulkier than batteries. Meanwhile the EEStor, which was going to fix that, seems to have wafted into some other dimension, perhaps to join all the other vaporware residing there. As much as we all might have hoped it was true, EEStor's fundamental claim that they had developed a thin-film insulator that could behave properly at up to 3500V was always at least a little dubious. You might be amused by molten salt batteries. "The high power capability is due to the very high ionic conductivity of the molten salt, which is three orders of magnitude or more greater than that of sulfuric acid in a lead-acid car battery." "They are the primary power source for many missiles such as the AIM-9 Sidewinder, MIM-104 Patriot, BGM-71 TOW, BGM-109 Tomahawk and others." "Sodium-sulfur battery and lithium sulfur battery comprise two of the more advanced systems of the molten salt batteries. The NaS battery has reached a more advanced developmental stage than its lithium counterpart; it is more attractive since it employs cheap and abundant electrode materials." Molten salt batteries (AKA Zebra batteries) definitely work but Li-Ion has pretty much passed them by. The Think City can be purchased with a Zebra battery. But the fact that they require such high operating temperatures makes them kinda impractical and they don't have good power density. They'll have niche applications but I doubt they'll make a come-back unless someone makes a significant advance in them . . . which is unlikely since pretty much no one is researching them now. H - Perhaps you've hit on a key point: "and dismiss the idea that the same people driving these current pricey vehicles can't afford' a ~ $26K Leaf." The folks who can afford the "pricey" cars are also the ones with less incentive to buy one: saving money of gas. IMHO folks who pay #12,000 for a little KIA don't do so in large part to save money on gas but because that's all they can afford. If I can afford/justify a $40,000 muscle car I can easily afford that extra $1,000/year for the gas. If I can afford a $30,000 e/hybrid I can also afford to pay the extra $500/year for a ICE that provides better options. And if I can't afford to pay that extra $500/year than I also can't afford to pay twice as much for my next vehicle to get an e/hybrid. I don't see auto purchases having much to do with ecology. The folks who pay the premium for this new generation auto are making a statement IMHO. All well and good but such folks make a very small percentage of the population IMHO. That may be the ultimate limitation for the expansion of e/hybrid autos more than any other factor. In the end it's not going to be about what anyone thinks is good for the planet IMHO. It's going to be determined on what they can afford. But not for all: I can afford a $50,000 p/u and the extra cost for gas. But I drive a nice KIA SUV that cost $17,000 and gets 23 m/gallon. I do so not to save the planet but because I'm cheap. LOL. In 6 years or so my KIA will be my daughter's first car. She'll be free to buy a e/hybrid at that time if she so choses. But she'll have to pay for it...something few 16 yo are able to do. I believe that the ability to pay/affordability issue really needs to be extended to energy conservation/efficiency in homes. The reality is that it is likely that those who are least able to afford "upgrades" are also the most likely to need them. In my case, if I hadn't designed and built an energy efficient house 25 years ago, there is no way I could afford to up grade the house now as a retiree. The same thing with our PV system and solar hot water..it wouldn't happen no matter how much I believe in them. In the UK, they are at least talking about things like requiring homes to meet certain efficiency standards before they can be sold, and requiring landlords to meet energy efficiency standards for rental units. I can't imagine that happening here. OTOH, we sure have a lot of room to cut back. A friend of mine who's an oenophile says she never understood why red wine was supposed to be served at room temperature. She thought it was best slightly chilled. Then she went on a trip to Europe...where she realized that "room temperature" there is slightly chilled by our standards. You make good sense, as per usual. What is needed is a mass awakening and adjustment of our 'needs'. I think that a small, light-weight vehicle (ICE/diesel/hybrid/EV) which could be speed-limited to ~40 mph and could carry 2-4 people with a modest amount of comfort (not luxury)(keep the rain and sun off the heads) would be all that most folks would need to commute to work, go to the doctor or dentist, go to the grocery store, etc. Even though ABQ is bisected by I-25 and I-40, I consider that commuting option to be for folks who don't value their lives...the ABQ major surface streets are mostly limited to 40 mph...and that is how the street lights are timed. Once you design a low-speed, light-weight (fiberglass or something similar? )vehicle you should get into a virtuous cycle where you don't need a beefy engine, crash forces are greatly lessened, road wear is lessened, noise is lessened, vehicle Maintenance costs are lessened (small tires are cheaper than large tires for example), etc. Everything becomes easier, safer, cheaper, once we shed the notion that we need 4-8K lbs of vehicle capable of rocketing from 0-60 and beyond in seconds. Honestly, the biggest feat to pull off will be to break out of the 'see the USA in you Chevrolet' and 'Like a Rock' and 'Ford Tough' macho BS we have been force-fed for years...breaking out of seeing our vehicles as rollings status symbols, mobile altars to our own perceived greatness. 1) OK, I get that many folks here want fervently for most personal vehicles to disappear and be replaced by trolleys and bicycles and buses etc. Nice idea, but will take a long time to morph our urban constructs to adapt to that...in the meantime (being ~30 years), if most people drove 40 mph NEV-like vehicles, we could slash our gasoline consumption, and reap the attendant benefits of lowering the amount of money we ship to our 'friends' in the ME, and lessening GHG emissions, etc. 2) Yes, I understand completely that folks in the constructions trades, certain other businesses, and farmers and ranchers need pick-ups and SUVs...go it, in spades. ...Doesn't apply at all to the soccer mommies and guys with something to prove who run up my @$$ on the surface streets and in the parking lots in these monsters with no cargo save themselves and maybe a kid or two or three. And hauling campers and boats and PWCs and four-wheelers out for a week-end jaunt is not a 'need'. But all this talk is moot as long as gas prices remain 'cheap',like they have been for over a year. I don't hear anyone carping about gas prices, and see plenty of newer SUVs and big pick-ups around town. I am back home in PA briefly for a family affair, and I can tell you that for folks here, like most folks anywhere I go, PO is about as remote from their lives and their understanding as the far side of Pluto. Aaah, but this is exactly why I have postulated my 'gas guzzler bubble' theory. Yes, people buy the cheap gas guzzler because the upfront costs are low. But the financiers may not be sufficiently accounting for the operating costs of the vehicle. If the person is only paying $1000/year in gasoline that doesn't change the person's finances much. But if gas prices surge and gas costs $3600/year then that is an extra $300/month cost for that person. Paying the lease/load-payment of that car plus $300/month in gas may end up looking like a bad deal. Especially if the fair market value of the car has dropped to below the amount owed on the lease/loan. Thus people may start to walk away from such vehicles & their loans. Dealerships may see cars return back onto their lots with the keys dropped in the key slot with a note saying "Keep the car, I am no longer going to pay the loan." That would be the extreme situation and I kinda doubt that will happen but it is possible. But I do think the fair market value of gas guzzlers is going to plummet once an oil crunch hits in the next 3 to 5 years. But that is pretty obvious since it already happened in 2008. People that do car loans are really going to have to start calculating fuel costs when determining whether to make a loan. If they don't, they risk having people start defaulting just like all the sub-prime loan people defaulted once home prices dropped and/or interest rates went up. And when the gas prices are high enough, a much more expensive pure-electric will be viewed as the cheaper car. Although the monthly car_loan only value will be much higher for an EV, the car_loan+monthly_fuel_cost will be lower for an EV than for a gas car eventually. Don't get me wrong though . . . I think there will be substantial economic pain when this happens. EVs are no panacea. However, EVs will act as backstop to prevent complete collapse. I don't subscribe to the societal collapse theory of peak oil because of this. Gas prices will go up, it will be painful. People will switch to public transportation, hybrids, plug-in hybrids, pure EVs, and the gas/diesel will largely be use for the really necessary applications such as long-haul trucks, farming equipment, aviation, etc. All good point spec. But who do you know has based their last car purchase on the basis of gasoline selling for more than 3X what it's selling for today? If the day comes that fuel does run up that high they may curse the day they made that decision years earlier. But it will be too late to make a difference then. Likewise I vividly remember the fuel spike days of the late 70's when folks paid (like I almost did) a premium for crappy little cars like the converted Volks. Rabbit diesel and then cursed that decision when gasoline prices plummeted. Oh I fully agree. And sadly, I do think there will be a lot of people cursing their car purchase decisions a few years down the road. And that is why I believe we are watching a gas guzzler bubble inflating up. If prices remain low, things will be fine . . . but I don't think that will happen. I think Chris Skrebowski's "end game" analysis do a good job of showing that an oil crunch is headed our way. It may not be peak oil but I think it will be enough to really change people's views on hyrbids, plug-in hybrids, and pure EVs. "Peak Oil" has largely disappeared from the news radar but it will resurface with a vengeance at the next oil crunch. Perhaps these buying decisions are practical, rational. Wouldn't he want to purchase a vehicle that would provide the highest utility factor in case he lost his job or had his hours scaled back? He looks around at his neighbors and realizes they have the vast majority of their net worth locked up in their houses. That housing stock will have to be maintained. Carpentry, roofing, gutters, painting, landscaping. Semi-skilled work that an able-bodied man willing to work can do. Work he can get paid for under the table, an important consideration as taxes inevitably rise. Cost of operation is only one metric, utility value is another, and the utility value of a truck vs a car is incomparable. Of course thinking of all the trucks on the road as insurance against employment insecurity makes the owners look rather silly as they sit in traffic with one person and an empty bed. But similarly, you could question the decision making of all the people who sacrificed utility for gas mileage and now have to request help with moving, light hauling, etc. My point is that it is not a slam dunk to opt for long-term cost over long-term utility. As America stair-steps down, people will want to retain their dignity, such as it is. The rational choice in that case is to purchase a vehicle that you can pay for in CASH. That way, if you lose your job, you can keep your car. At least that was my choice for my last two vehicles. If by utility factor you mean a car that can be used as a truck or into which a mattress can be thrown, I miss my minivan. Might buy a used one to keep around. yes indeed, minivans can be had cheap and high utility factor there. Gives you something to offer in the gift economy or the grey economy of our future. Helps to link you in the web of reciprocity that all the EV owners will remain aloof from as they stay tethered to the cash economy. It will mark them as members of an urban elite and make them very anxious about the 'range factor'. But that may end up being a very foolish choice if you can no longer afford to drive that vehicle and/or its fair market value plummets because gas/diesel prices go way up. 1. Pricey for small car - how safe will it be? 4. Never buy first year model. 5. It's not even available. 6. Battery tech is changing rapidly - will the Leaf be obsolete in a few years? I favor a stiff gasoline tax - perhaps use that to promote NG and electric cars. Sure, it would be a fine idea if it could be put into place, but what politician could survive his next election after proposing or voting for such a plan? I don't know the actual figures, but 1000 recharges (five year life) and $8000 for a new battery pack have been mentioned in the past. If you're in the market for a used car, how much would you pay for a four-year-old Leaf? Compare that to a four-year-old SUV or Corolla. According to this article the Leaf has an 8yr, 100,000 mile warranty on it's battery that the manufacturer is very comfortable with. Costs for Lithium based batteries vary from about $300/kWh at the low end to $1200/kWh at the high end. Based on those figures the Leaf's battery could cost anywhere from $7,200 to $28,800 but, whatever that figure is, it should go down considerably over the next 8 years. What happens if some Chinese battery manufacturer starts making "substitute" batteries for EVs or some European battery manufacturer starts offering specialized "high performance" battery packs optimized for hot weather, cold weather, longer range or more aggressive driving? That would mirror what happens in the car parts business now with dirt cheap knock off parts on one hand, more expensive "performance parts" on the other hand and the manufacturers "genuine replacement parts" somewhere in the middle. In my neck of the woods, "genuine" parts are most often very expensive and sometimes impossible to find. Case in point, a headlamp bulb, generic $3, from the Nissan dealer $60. In 8 years time who knows what gasoline is going to cost or how available it's going to be? We just don't know what the relative value of the different types of vehicles is going to be. Lets face it, we don't even know if civilization will bear any resemblance to what we have now. Let me address your comments with my obviously pro-EV biased but hopefully pragmatic view. First let me say that right now is an early adopter stage and the people that buy now will definitely pay a higher price than for subsequent generations and get less features. But that said, the Leaf looks pretty nice as is and the $7500 tax-credit is a juicy subsidy. 1. Yes it is pricey. But the cars pass all the same crash tests as existing gas cars. 2. Nissan will repair it. But the good news is that there really should be far LESS repairs because EVs are much simpler and have less moving parts. 3. As long as you have a home with power at your parking place, it is not much of a nuisance. It is 5 seconds to plug it in and you wake to a full range. That range is an issue though. 5. Agreed . . . they are no longer taking reservations. 6. I agree but that is great news even if it is bad news. Yes, you may have bought the early generation battery but you'll be able to install the new battery technology when you need it. They'll just drop out the existing pack, put in a new pack, and adjust the software to adjust for it. Nissan actually planned ahead for this. Actually $26,000 is near the median transaction price for a car in the U.S. While base price to base price (or median transaction to median transaction) is the fairest comparison, the Leaf is quite affordable to its target early adopter market after subsidy. I have sales data for the US for March. At $22k the Prius is selling ca. 10k units/month; at 200k LEAF output per year that would be 16.666k sales/month, not an outrageous goal at all, actually - Prius was #20 for March, #19 was the Toyota Highlander, with a base price of $25,855 and 11,953 sales. The Chevrolet Impala has a base price of $23,890 and 15,594 March sales. Assuming the thing works Nissan's goals aren't outrageous, albeit perhaps a bit high volume production for the MSRP. Perhaps some of that 200k LEAF output is destined elsewhere. There is a museum staff and parking lot I visit. These are young craftspeople, shopkeepers, accountants, archivists, and artists. Out of the dozen parking spaces, Prius EVs fill three of them. There are also three diesel Mercedes running on vegetable oil. "So much for the Great EV Hope." Don't get discouraged. This is the first generation. (Second if you count EV-1 as the first.) In another five years, after the early adopters have found the bugs, the next generation will be much better. Edwin Black's book Internal Combustion covers the sordid early history of the automobile in detail, for the curious. Was decades of stabbing in the back by a cast of characters attempting to market EVs before Ford and his Flivver. On the contrary . . . . in the same article . . . The model also forecasts sensitivity to gas prices, which will have a considerable effect on uptake. Rises in electricity prices do not affect sales as severely, Bloomberg New Energy Finance concludes, as fuel costs are a lower proportion of the total cost of ownership for electric vehicles. That is the exception that swallows up the rule. If gas prices remain as they are now or only go up a little bit then EVs will remains a niche market (for national security hawks, tree-huggers, etc.). However, if there is an oil crunch due to peak oil (a main thesis of this web site) then all bets are off and the main assertion of that study is obsolete. People will begin to switch over as a hedge against crazy gasoline prices. Why buy a car when gasoline prices may shoot up 3X in the next few years? However, I fully agree with the assertion that "price will be the most significant limitation to the uptake of both plug-in hybrid vehicles such as the Volt and fully electric vehicles such as the Leaf. " But you need to look at both the price of the EV AND the price of gasoline/diesel. A $30K Leaf will look pretty damn good if gas costs $10/gallon. A $30K Leaf will look pretty damn good if gas costs $10/gallon. Sure. I just don't think $10/gallon is possible. In the last gas spike the economy tanked and prices never really got above $4/gallon for very long. I think we're going to see the same pattern again in the future. But that is very provincial thinking. Yes, our economy collapsed and the use of oil in the USA has dropped significantly. But that didn't stop oil from rising from the mid-30s back up to the mid-80s per barrel. Why? We are not the only people in the world. The use of oil in China continued to rise despite the higher price. If this is your first car then $80/barrel is the only price of oil you've ever known. I agree that $10/gallon is not going to happen in the near future. However, over time it is a certainty. But $5/gallon or $7/gallon is possible in the next 3 to 5 years. And it is a price that an economy can live with . . . Europe has proven this for many years. We will just have to adapt. As Jeff Rubin says, you won't need his book to know what to do when gas costs $5/gallon. But that would require $250-$300/barrel oil. You really think the economy can live with that? For an indefinite length of time? I don't. Europe has proven this for many years. Europe is a very different place and a different case. But oil prices in Europe rose and dropped along with their economy just the same as in the US. The use of oil in China continued to rise despite the higher price. China's demand wasn't enough to keep oil from falling from $140/barrel to $30/barrel. The supply system was temporarily flooded due to a demand crash at the same time as Saudi Arabia surged from storage. "US Coal to Gasoline Plant Will be the Largest in the World"
US coal deposits contain 12 X as much energy as all known oil in Saudi Arabia. The gasification process to be used in the new West Virginia CTL plant could cleanly utilise coals of any grade -- including the cheapest and dirtiest coal. By moving US coal reserves into the liquid fuels arena, the prospects for peak oil continue to remain slight -- unless the Obama administration decides to shut down all coal, even clean coal projects. Obama has promised to bankrupt coal companies, and all his other policies are consistent with an "energy starvation" approach to shutting down US industrial production. Time will tell." Edit : political side-comments notwithstanding, what is the EROEI of coal-to-liquids technology ? I doubt seriously if Obama has promised to bankrupt oil companies but it is a damn good idea. Coal to gas is just another form of heroin. End the addiction. U.S. industrial production? The corporations aided and abetted by the U.S. Chamber of Commerce can do that quite well without any help from Obama. I think the biggest issue with media today is that anything can be written and presented as "fact" and people will believe it. To whit, the "$200 million dollars" being spent on the President's Asia trip. Sheesh...doesn't anyone fact-check first ? I had someone tell me last week that ANWR has 50 years worth of oil. This from a guy that was managing a (Republican) senatorial campaign. It's an easy talking point to drop to the uneducated. When I tried explaining that reserves had just been downgraded by 90% by the USGS, he got the famous long, blank stare - apparently, his only motivation is to wrest the ANWR hostage from the grip of environmentalists. It never occurred to him for a second that there might be nothing worth drilling up there, and there's no canned talking point for it yet. ANWR wasn't downgraded - only 1 test well has ever been drilled in it, no one knows if has much of any oil in the first place. The area the USGS revised estimates for was the National Petroleum Reserve - Alaska, or NPR-A, after extensive seismic studies and exploratory drilling. As for ANWR just direct them to the Analysis of Crude Oil Production in the Arctic National Wildlife Refuge that Ted Stevens requested from the EIA. They won't like the results, natch - I think Ted requested it so he could shove it into peoples' faces and get them to shut up about it already. Yes, correct - the NPR-A was downgraded. I think the distinction would have been lost on him anyway, and my purpose was to see if I could get him to think, rather than spit out talking points. I failed, in any event, since I sent him a copy of the report below, posted on the Energy and Capital website, also posted here on Drumbeat a couple of days ago, and got no response. I think he's still looking for the trap. Maybe I'll give him a copy of Jeff Rubin's book to read - if I can get him past the notion that it is a political book promoted by "the other side". The problem with discussing ANWR is that it has been fought over so long that in most people's minds there is very little middle ground for rational discussion. It has become somewhat like trying to discuss abortion or gun control. One side has become convinced that there are huge oil fields there, just waiting to be tapped. There is no room for doubt in their minds. They simply do not want to hear, and refuse to accept the idea that there may not be any large fields to be found in ANWR. The other side is convinced that exploring ANWR would lead to destruction of the "last great wilderness" on earth, the end of the caribou etc etc. Also, ANWR has become a huge cash cow for the environmentalists. Awhile back someone suggested that the big enviro groups really don't want to see the 1002 area get any permanent protection. As long as it is contested, they can use it as a rallying cry for fund raising. Regarding the USGS estimate, people need to realize that it is at best a guess, based on very limited data. In this case the data is a more than 20 year old 2D seismic survey on a ~ 3 by 6 mile grid, well data from surrounding areas, outcrop data, and some gravity and aeromag data. My own personal view is that while the USGS numbers are OK as an upside, their downside should be much much lower. While I think it likely that if ANWR were explored some oil will be found in the 1002 area, it might be rather disapointing to many. A really big field is possible, but I sure don't count on it. Those who think ANWR is a sure thing should review the history of the Mukluk prospect. I meant "bankrupt coal (not oil) companies". "I doubt seriously if Obama has promised to bankrupt oil companies"
Actually, he did promise to bankrupt coal companies. A few CTL plants are a fine idea to provide the fuel to keep the trains and ships going in case of disruptions to imported oil. They will not be able to maintain BAU on their own, an important distinction that often gets ignored by both sides. Do u have a reference for when O promised to bankrupt oil companies. If he really did this, my view of him will be upgraded. He did not promise to bankrupt coal companies. What he said was: "If someone wants to build a coal powered plant they can, it's just that it is going to bankrupt them because they are going to be charged a huge sum because of all those greenhouse gases that is being emitted." The statement obviously was not directed at coal companies but at those who wish to build a new coal fired power plant. The US uses 539 mtoe/yr of coal and has a R/P of 245 according to BP. The Saudis produces 450 mtoe/yr of oil and a R/P of 74.6 years. (539 x 245)/(450 x 74.6)=3.93= ~4 times, not 12 times. The efficiency of F+T coal to liquids process is about 45% thermally efficient. The efficiency of oil to liquids is about 85%. So its liquid fuel resource from coal is ~2 times. OTH, the US consumes more than twice as much oil as Saudi Arabia produces so using coal to provide liquid fuels for US consumption would not last any longer than current Saudi production. Actually Obama has promoted clean coal/CCS projects with some taxpayer money. Hitler's Germany proved that coal to liquids production on a large scale can sustain a military-industrial complex and a potent war machine. Just to meet the needs of the U.S. Air Force, Army, and Navy, I think there will be strong political support for coal to liquids production in the U.S. Indeed, if coal-to-gasoline works at $100 barrel gasoline, then I think there will be a rush to coal to liquids production in the U.S. over the next twenty years. I forget the costs that South African Sasol claims for its oil products, but if memory serves they claim way less than $100 a barrel costs. Of course coal to liquids is a horrible pollution problem, but from a political point of view, making gasoline available to American voters will far outweigh worries about global climate change from additional CO2 added to the atmosphere and also other kinds of air pollution. The correct method IMO would be implement domestic oil shale production, not coal to liquids. Colorado-Wyoming-Utah oil shale represents 400 billion barrels of oil or 54,570 mtoe, which at current US consumption would last 64 years. Using the Shell in-situ process that conversion process would take about 50,000 mtoe of primary energy or 38% of all US coal reserves(coal being the cheapest fuel) or 781 mtoe/year >539.5 mtoe current coal production, none of which is used to produce liquid fuels today. If 100% of US coal proven reserves were used to make exclusively liquid fuels(no more coal powered electricity) it would only result in 68,732 mtoe of liquid fuels. Oil shale would significantly increase the fossil fuel base of the energy system. Hitler's CTL peaked at 45000 bpd and Sasol is ~ 100000 bpd and Sasolberg production is being curtailed in favor of GTL. I hope you are right about the economic feasability of shale oil. But of course I'm skeptical, because I have heard of "breakthroughs" in shale oil production for the last fifty years. Sort of like fusion power--nothing wrong with it in theory, but a history of fifty years of futility. No technical 'breakthrough' is necessary. The fusion analogy is not even close to correct. The technology of extracting oil from shale is straight forward. Before 1880 most mineral oil in the world was produced by heating oil shale no richer than Colorado oil shale. The secret is huge amounts of heat. The upfront cost of the Stuart Shale project was ~$300 million AU dollars and the project produced 1.5 million barrels of oil after 5 years of production. but there was strong environmental opposition and the project has been suspended. It was a matter of grow or die. was sold by Reagun for pennies on the dollar and is now profitable). As usual glib economic ideology is the most dangerous opponent of either peak oil or climate change mitigation. It will abandon necessary energy investment based solely on the illusion of 'profitability'. Unless it is defeated, I expect the HL crowd soon will get to see the final sudden crash of the modern world. People who believe in a symmetrical Peak with oil production crashing due to the imminent exhaustion of cheap oil. If unconventional oil is deemed by TPTB as uneconomic then a speedy collapse is probable. Sasol's production costs were reportedly in the $15 - $30 per barrel range, IIRC. Of course, one has to remember they operate in Rands, with an exchange rate of roughly 7 Rands to the Dollar, and retail gasoline prices in SA are fixed, so it doesn't really translate into what it would cost in the US to produce, or what retail prices might be. If the U.S. can do coal to liquids at $60 a barrel, then I think most of the coal in Montana will be turned into liquids, as well as a lot of coal from other parts of the U.S. I suspect that U.S. coal mines are more efficient and lower-cost than South African coal because of the huge capital investments in up-to-date technology in the U.S. South Africa has lower labor costs than the U.S., but I do not think this lower cost of labor in South Africa is enough to offset U.S. advantages in quality and quantity of coal and also the greater and greater capital investments in U.C. coal mines to boost productivity. What is the cost of natual gas to liquids? I understand that ng produces a very clean deisel fuel. We need to conserve our natural gas for heating buildings and also for standby electrical generating capacity. Natural gas is extremely cheap now and if prices were to remain at current levels I think NG to liquids would work quite well. However, before too long (a few years) natural gas prices could well triple or rise even higher than that. I agree. I think we are getting lucky the past few years with such cheap NG. My heating bills have been so cheap that i really haven't been in much hurry to heat with wood. Sailor - Over 35 years ago Mobil Oil was converting NG to gasoline in New Zealand. Old technology. Of course it only worked because they got the NG virtually free because there was so little local market demand and such high gasoline prices. The same basic problem so many so-called solutions have: technically doable but not economic. You can convert NG into almost anything but at a cost. And if the costs approach economic levels than the demand for NG will climb...along with it's price. The great majority of "solutions" I ever seen ingnore this feedback loop. I can see the same problem with CTL if it were to be scaled up: The demand for coal would increase a great deal, and thus the price of coal would also increase a lot. One thing I know nothing about is the price elasticity of supply for coal--e.g. how much would the price of coal have to rise over, for example, ten years to double U.S. coal production in that time period? sailor - I wouldn't try to make a guess either. But my instincts tell me the political/environmental aspects of coal expansion will slow the uptake considerably. OTOH if gasoline jumped to $8/gal for an extended period of time I suspect our national desire for "greeness" would quickly melt away. I think it would take only an increase to about five dollars a gallon of gasoline for environmentalists to be shunted aside and CTL to get major federal government support. There will be a mighty outcry among "the people" when gasoline breaks that important psychological $5 barrier. Politicians will pander; they always do. Forced power outages aimed at meeting China's energy-saving goals have led to "unprecedented" diesel shortages, as companies buy diesel generators to keep operating, the Xinhua news agency reported on Sunday. The China Chamber of Commerce for the Petroleum Industry said more than 2,000 privately owned gas stations in southern China had shut down due to a lack of diesel. "The real story in China is that there's massive shortages right now," Mr. Ting said. "China has experienced seven consecutive months of [fuel] inventory drawdowns. We're talking about massive, massive drawdowns." Six months ago, China had enough fuel on hand to meet more than 36 days of demand. Today, inventories would meet 16 days, and that number is falling fast. According to your second article China claims to have imported a record 5.7mb/day in September up 24% from a year earlier. Yet despite this they have massive stock draw downs, regional wide power blackouts and widespread diesel shortages. And China has just once more become a net diesel importer for the first time since the 2008 Olympics. Hmm... so clearly China either lets itself grind to a halt or massively ups imports of crude and diesel even further. Funny how we always seem to believe Chinese provided figures at face value when at first glance you might think that their oil imports had dropped to cause the above listed problems. Oh wait I forgot they have sky-high self reported growth which trumps even a 24% rise in imports. Or do they fiddle the numbers and just hope we don't pay attention to the details too closely? 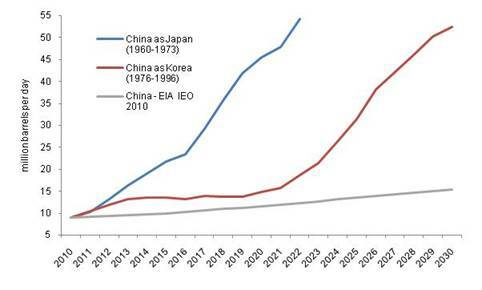 Maybe China is growing "as Japan (1960-1973)". Chart from How Fast will China's Oil Demand Grow? Throughout 1960-1973 reported world oil production increased pretty much at 7% a year - regularly like clockwork. If we can restart that 7% growth then China should be able to follow the Japanese curve! Coal consumption for instance suddenly dropped for 1998 while growth stayed within the normal range. Right now I can't figure out a good reason for them doing this, but a good place to start with cross checking would be the National Bureau of Statistics of China monthly updates, and more specifically the Output and Growth Rate of Major Industrial Products page. Another one is the Energies and Utilities section of the China Economic Information Network. As these figures refer to physical quantities, which by essence are harder to inflate than monies, I'd second or paraphrase a recent post by WHT and would think that they are rather raw than cooked. Update: Oops, an old link for the second reference. I'll try to come with the new one. Just as well for China then that their own September reported crude production is up 9% on September last year. Otherwise they would have had to import another 350 kbpd in September which would have taken them to over 6mb/day based on the figure upthread! This has similar and up to date content. Sinopec cuts diesel exports by 70%. Long queues of cars and even "Sold-out" signs at gas stations are increasingly common scenes in many cities. Additionally, the market monitoring of the China Chamber of Commerce for the Petroleum Industry has acknowledged that more than 2,000 privately-owned gas stations in southern China had shut down due to their not having diesel fuel to sell. I don't know what the MOLs (minimum operating levels) are for China, but let me take a guess and say they have already dropped below them. Based upon prior events like this, once below the MOLs the distribution system quickly becomes destabilized - and does not easily return to some level of stability. Being that US diesel inventories have also been dropping, not to mention strikes in France, China will have a bit of a tough time finding enough diesel. According to the WSJ, Chinese refiners are already at peak output. The WSJ may indeed be correct that this will push up oil prices. That is because refiners will be able to realize a higher refining profit with elevated diesel prices - even if this means making a low profit on the balance of a refined barrel of oil made into other products, such as gasoline. According to the WSJ, Chinese refiners are already at peak output. "The country is changing its attitude toward the usage of natural resources as the government continues to sort out the price relations of resource products including coal, electricity, oil, gas, water and minerals," said Zhou Dadi, a researcher with the Energy Research Institute under the National Development and Reform Commission (NDRC). "For limited resources, the more you use, the more you should pay." China plans to cap coal output during the 12th Five-Year Plan (2011-2015), and to establish mega-sized corporations as the industry consolidates, according to the NEA. Meanwhile, the country is likely to limit annual coal production to between 3.6 and 3.8 billion tons in its next five-year development plan, according to China Coal Research Institute. Nevertheless, compared with massive power blackouts and fuel shortages, gradual price rises are a more desirable way for the country to ease its immense energy pressure. More such price hikes will not only urge consumers to adapt to the dire energy reality but also encourage corporate innovation to profit from addressing the long-term energy challenge. Chinese policymakers should seize every chance to make the whole country aware of their energy-saving responsibilities. Chinese consumption was 3 billion tons in 09, 1.1 billion more than five years years ago. Over that same time span Australian plus Indonesian production went up by some 165 million tons. With a cap at 3.8 billion tonnes for 2014 Chinese production, they would have to more or less double that over the next five years only to make up for the likely differential with demand. As far as I can remember (i.e. more or less ten years) there has been a track record of underestimating future coal production in China. Also worth mentioning is that one of the texts uses the words "resource tax reform program" to achieve the proposed aims. "Coral Suffering near Gulf oil spill site"
"(CNN) -- Scientists have found evidence of "dramatic" damage to deep-sea coral near the site of the Gulf oil disaster, with one biologist describing it as a shocking find that "slapped you in the face." "This was the first time that anyone has seen a visually compelling indication of impact to deep sea animals in the vicinity of this deep-sea event," said Charles Fisher, a Penn State University biologist and the leader of a government-funded research expedition. " I guess this isn't big news because people don't eat/profit from deep sea coral. Some great points about risk management, but it is hard to picture a downward spiralling government and economy grabbing more control if and when crops fail and cities flood. MAybe the plan is yet another neocon way to destroy the Feds, this time by bankrupting it through FEMA? The world’s leading oil producer Russia’s oil production climbed to 420.161 million tons till October this year, up 2% from last year, Milton Financials was told. The Russian Energy Ministry recently announced that oil exports for the same period had fallen by 0.4% to 205.244 million tons. I guess oil consumption in Russia is finally on the rise again. ELM in action? Oil production in Russia set a new post Soviet record in October but production, so far, in November is down. A higher export tax went into effect November 1st. So all the Russian oil companies dumped everything they could on the market in October to get it out before the tax increase. It is likely that all their storage tanks are empty now. For those interested Russian oil production, day to day, can be found here: CDU TEK: Russian Crude Oil and Liquids Here you will find Russian daily production in tons of all liquids. They never give a weekly or monthly average however so if you want that you will have to track it daily. That is what I do. Do EIA numbers seems to track the numbers you calculate for Russia? Hopefully Ron sees this and gives a more current and detailed answer but I tracked these numbers for a time (mainly for natural gas but I recorded oil as well) and, if I recall correctly, they did seem to match what was later reported at that time by the various agencies. Thanks! I was hoping EIA would do this for us. Being a current member of a REA (rural electrification administration)co-op is interesting. REA co-op's were established during the great depression to bring much needed and cheaper electricity to rural areas. After doing a COSA - cost of service analysis our co-op needs to raise rates 5% this year and 6 % next. With the possibility of more. While this isn't really interesting or surprising there is this gem buried inside the article. The other area we will continue to address is the facility charge. The COSA indicates that our cost to maintain the system on a per meter per month basis is about $80 to $88. We are the only industry that does not charge all of its fixed costs up front, then charge for usage. Gas, water, sewer, phone, etc… all operate this way which allows them to be able to know that the base rate covers all of their fixed costs each budget year. We cannot do this as the majority of our revenue comes from kilowatt usage. If usage is up we can cover our costs. If they are down we will be caught short. We currently pay $25.00 per month to which they will add $3.00 for a new office outside of flood danger, needed as they have had two office swamping floods in @10 yrs. I was shocked $80 -$88.00 per meter per month whether you use electricity or not. Our current KWH 10.5 cents. I work in a forty-person group, and our budget is a million (USD) a year just for the people. That seems exceptionally high. My non-fuel charge is $5.90/Mo. which is $70.80 a year. I've always assumed that covered everything PJ mentioned. Maybe they meant $80 -$88.00 per meter per year. Now you made me go and look. Basic charge is $12.40 a month here. No I looked its per month. REA co-ops have high expenses because it is rural. The costumers per mile of line is very low compared to in town. I'm in no way complaining as I realize their predicament, and I have tried to generate my own power so its still a bargain. If you look at their pricing model you understand that this could easily become a spiral. Cost per KWH goes up so people cut back. This cuts into their base budget so they need to raise the KWH price again, it could easily be a upward spiral that tightens as is goes. We have electric hook up at some land we own and i know just the service charge each month, regardless if we use it or not, is $30 (it could have went up)... Some months no one is even up there. Rural electrification was the last to be added. It may be the first to be lost. A lot of people think that cutting electricity usage is good, but there are downsides as well as upsides. Somehow the electric company has to pay back its debt and cover its overhead expenses. If people are using less electricity, the electric company needs to raise its rates to make these things possible. Fuel costs are a relatively small part of the rates. If electricity usage is less, it is also much more difficult to add renewables, like wind. Utilities add new sources or production when demand is increasing, not when it is decreasing. Heh, and people site the high cost of solar installation. Crowds are often poor at recognizing the early stages of change. Sometimes they remain delusionally complacent and then experiences rapid collective recognition. The classic example is WWI. The crisis started on June 28 with the assassination of Archduke Ferdinand of Austria. People (and markets) remained calm despite rapidly rising geopolitical tensions until major mobilizations began on July 30. Then people freaked out, too late. If we are to stand by the recent Great Recession as being the first major economic step down via peak oil after several years of plateau oil production, then we must also recognize that most people, including MSM, responded in the manner explained above by remaining delusionally complacent. I would take that a step farther and say you can't even get people to accept it when confronting them with the evidence available. Like a steel ball bearing on oil you're trying to hold with a tip of a pin head, it will roll away in some direction, any direction to avoid accepting something most people's minds don't want to. I do think the next step down, whenever that does occur (probably 110-125 a barrel), will be a point in time when the mortgage meltdown cannot be blamed, but maybe some will blame spec (although of course it's supply & demand), but anyway people might start to get it then. Maybe CNBC will even get it - well we can hope. I am shocked and amazed that not one person in DC has recently discussed publicly the price of oil and the effect it is having on the economy. Not anyone in the White House, the Senate or the House. They're too busy chucking accusations at 'THE OTHER PARTY!!!' about things that pale in comparison. "some will blame spec (although of course it's supply & demand)"
Of course it was S&D when last oil traded at $140/b. But in the next run-up the banks will have been primed with QE dollars to lend to hedge funds, all cluelessly chasing a big killing the oil futures. I fixed the TV this weekend to let our visitors watch football. This morning, after reading "The end of the world. That is, the end of the world we’ve known since WWII" above, I turned it on to scan the AM news shows. The first thing I was treated to was Mitch McConnell dismissing the "so-called" increasing income inequity in the US, despite all evidence to the contrary that this inequity is "so-called". Virtually everything I watched was transparently aimed at convincing the masses that BAU will continue, growth is inevitable, and that their way of life is safe and secure, again, all evidence to the contrary. They peoples don't want to know. Amazing isn't it how in spite of facts, something can be claimed to the contrary without offering up any facts and sheeple believe it. I've been watching with morbid fascination as they blow off all attempts to identify exactly what budget cuts they plan to make with respect to cutting the deficit, although "we have to continue the Bush tax cuts for all Americans". It's an absolutely solid, impenetrable wall of talking points - "across-the-board cuts". I'm reminded of soldiers under interrogation - "just repeat name, rank and serial number". Edible-oil prices may climb as growth in worldwide supply fails to keep pace with the rise in demand for a third year, with weather patterns hurting crops, according to Godrej International Ltd. Director Dorab Mistry. ...Supplies of soybean, palm, coconut, groundnut, cotton, rapeseed and sunflower oils will rise 3.5 million tons in the year to September 2011, according to Mistry’s remarks. That’s less than the 3.8 million-ton gain he forecast on Sept. 26. Demand in the same period would rise as much as 5 million tons, according to the text. The UK has, unlike Canada, shown it is open for foreign investment in the farm sector with a second takeover of a farm business in a week, neither of which is expected to hit regulatory buffers. The UK has a "for sale" sign on it. Oligarch in car runs over upper middle class guy, a transplant surgeon, on a bicycle. Oligarch escapes with slap on wrist (so that he can pay "restitution"), upper middle class guy faces lifetime of pain. Interesting, isn't it? How similar this is to what is actually happening in the economy? Except that the upper middle class haven't felt the pain yet. In time, they will. We are screwed, folks. Although I don't completely agree with her, I am beginning to see why Stoneleigh decided to spend most of her time on finance. We can huff and puff about EVs and production numbers and net exports until we're blue in the face. What difference does it make when we've set up a system that allows some of the most pathological people on the planet to run us over and make billions in the process, and pay us off with food stamps when things go awry? But then again, to crib from the sarcastic words of my driving instructor (years ago) on the need to drive defensively, there are plenty of drunk, careless, or incompetent drivers out there in part because "the jury often decides that 'here but for the grace of God go I'". It would take a sea-change in public and legislative attitudes to alter this, which seems impossible in an environment charged with the sort of political correctness under which any concept of personal responsibility is anathema. Public opinion can change, it just takes determination. Oh, and access to the media. Oh, and money. Today we ROV-watchers at #theoildrum chat saw the end of the Deepwater Horizon Macondo MC 252#1 subsea operations. After cementing the top of the well bore and testing the cement, a cap in memory of those who died in the Deepwater Horizon accident was placed on the wellhead. As this is a "well from hell", the ceremony fittingly included a screw-up and ..... bubbles. You don't have permission to access the requested content. if I try to go to the URL directly and it doesn't show up on the front page. Leanan please fell free to delete this post if/when fixed. Btw, the BBC website shows a variant of Test Card F if it completely falls over. Looks like the service interruption is over now?